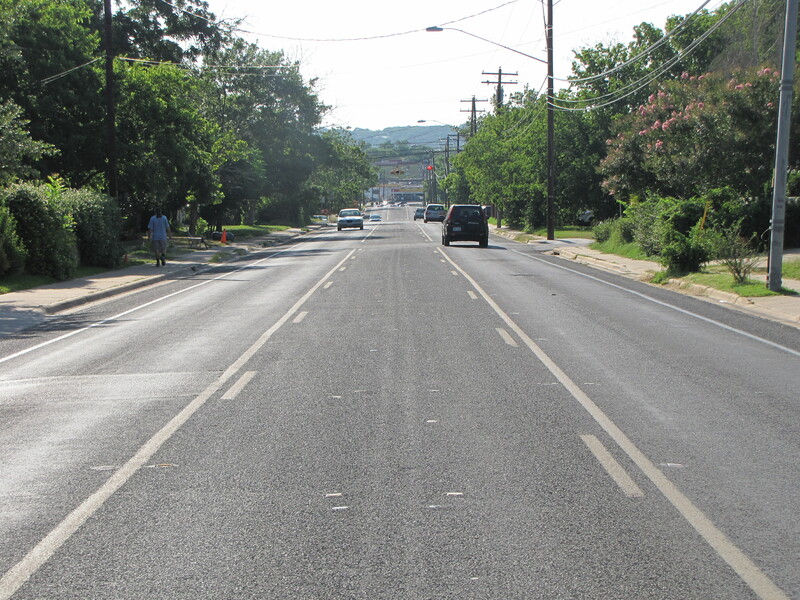 Austin has lots of wide streets. As is common in most cities, particularly in the South, where population growth has been rapid since the end of World War II, Austin has lots of suburbs with wide streets. Neighborhood collectors of 40 feet or more in width are not uncommon. The street in front of my house is one of those streets that measure 40 feet from curb to curb. This is a view of a typical neighborhood street with a 40 foot cross-section and long blocks. The bike lanes are five feet wide, which leaves 15 feet for the travel lanes so road humps had to be added to slow traffic to near the posted 35 MPH. Neighbor hood road with 40 foot cross section split into two travel lanes and two bike lanes. 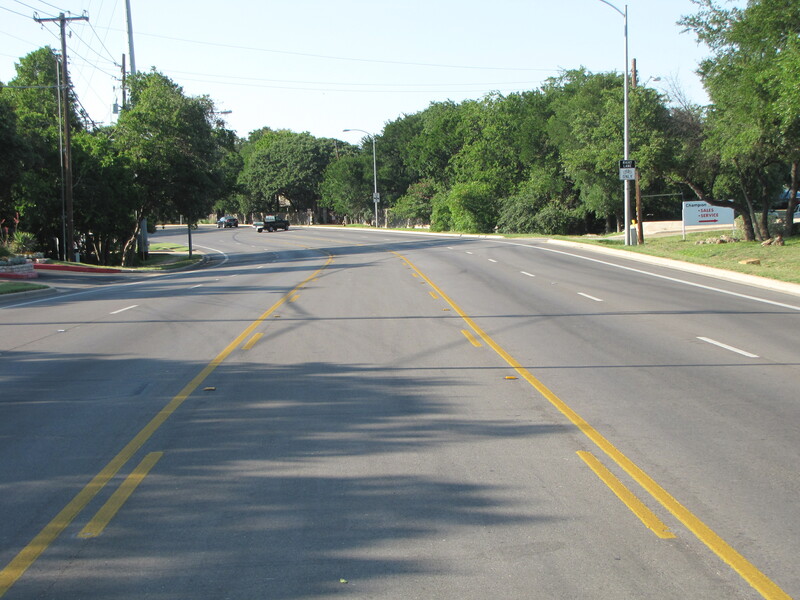 The City of Austin Public Works department has taken advantage of these wide roads to provide space for bicyclists in various ways, notably with differing forms of “road diets.” Typically, a road diet is where a wide road with four or more lanes is re-striped to provide a center-turn lane, one travel lane in each direction and a pair of bike lanes, one on either side. Variations on this typical treatment are many and Austin Public Works has used at least three in modifying streets in the city. 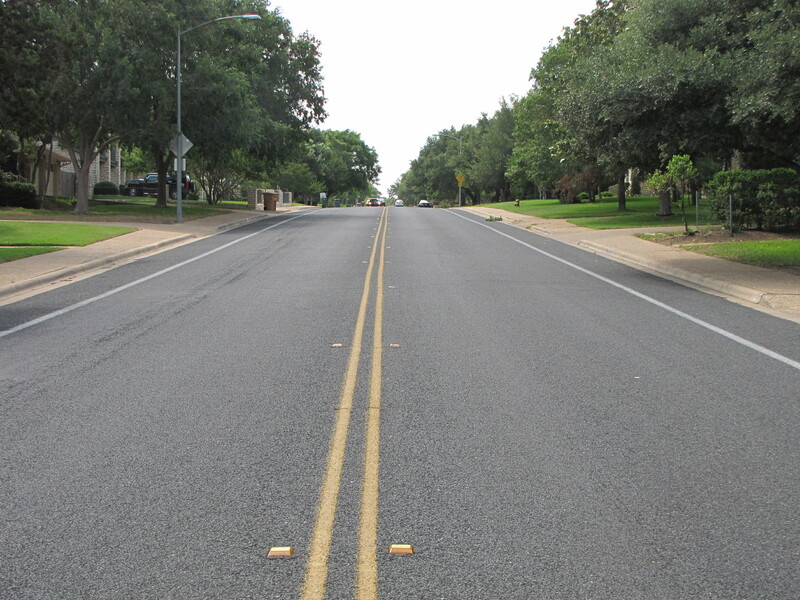 Jollyville Road is a neighborhood arterial that runs parallel to US Highway 183 (Research Blvd) for about five miles. With a limited number of driveways and long distances between intersections, this road is well suited for traditional bike lanes. Configured with four travel lanes (12 feet wide) and a center-turn lane (16 feet wide) and having a posted speed of 45 MPH speed limit, this road was not a bicycle friendly road and traffic frequently exceeded the posted limit. By narrowing all five lanes by two feet and striping bike lanes on each side the city was able to create a great bike facility. Speeds are now down closer to the 45 posted speed due to the narrowing of the travel lanes to 10 feet and cyclists are able to travel along Jollyville Road without taking a lane in front of high speed traffic. While not a “typical” road diet with removal of travel lanes, the narrowing of the travel lanes has achieved much of the same effects. This road has become a commuter route of choice. Five lane road converted to five narrow lanes with bike lanes. 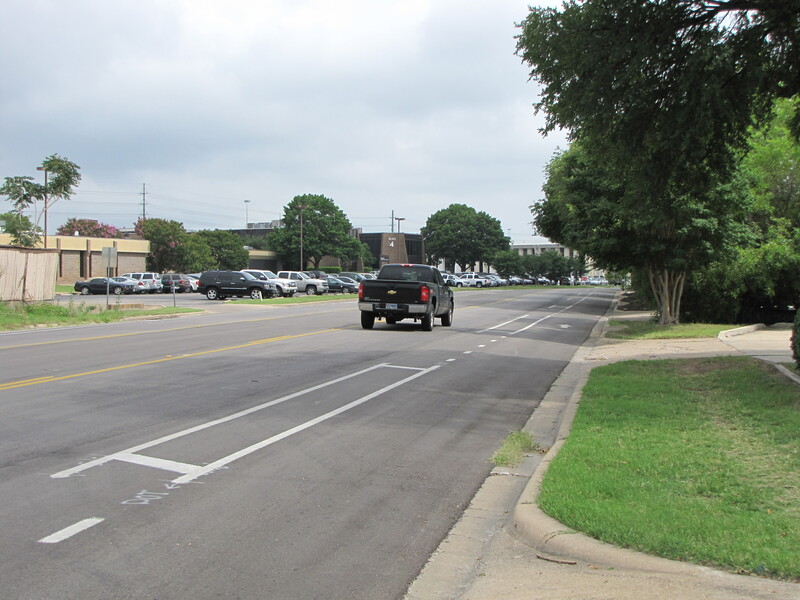 North Loop in the section from Burnet Road to Lamar Boulevard has been converted into the quintessential road diet. Formerly a four-lane road, it was converted to a two-lane road with a center-turn lane and two bike lanes. Also typical of a road diet, it garnered a large amount of negative publicity from the local community when it was first planned and even more after it was installed. Once the community realized that the center turn lane cut down of many of the conflicts that occurred on the former four-lane road the furor tended to settle down. Now, some two years into the change, the “new road diet” is being treated as if it has always been that way. Traffic through put has remained about the same and the crash rate has not increased. What has changed is the large number of cyclists that use this road for commuting each day. Connecting a large residential community with a major north/south collector with the state government health complex and the north end of the University of Texas campus this route is a natural for commuting. A traditional road diet, four lanes converted to three lanes with two bike lanes. Shoal Creek is one of the major north/south bicycle routes in Austin. It runs roughly parallel to the actual Shoal Creek and its character varies greatly over its length of roughly 10 miles. On the north end, where it connects Highway 183 (Research Blvd) to Steck Avenue, a distance of roughly 1.3 miles, the City Public Works department has recently created a special version of a road diet. What was once a four-lane road with center-turn lane and very narrow bike lanes has become a much better bicycle facility. It still has many driveways that create turning conflicts but the wide bike lanes with the painted buffers make the probability of a turning crash much less likely. Instead of being hidden by two lanes of automobiles when a person is turning left, the cyclist is much more visible and also has a better chance of seeing the turning vehicle. Five lanes with narrow bike lanes converted to three lanes with buffered bike lanes. The following short video is interesting in that it appears that the driver merged into the buffered bike lane to turn right. This is the proper, legal and safest way to make a right turn but it likely would not have happened in the old configuration. This video shows the view of a cyclist riding from the old cross section to the new cross section. The engineering staff in the Public Works department has demonstrated an amazing ability to be creative when repaving roads. The city is repaving and restriping about 15 miles a year of road and each one is evaluated for how it works for cyclists. It appears that we have been successful in taking road space away from motorists and rededicating it to cyclists. Three roads, three different solutions. Five lanes to five narrower lanes with bike lanes. Four lanes to three lanes with bike lanes. Five lanes to three lanes with buffered bike lanes. The Public Works department is to be congratulated. This entry was posted in Austin, Facilities and tagged austin, bicycle, bike, neighborhood street, shoal creek, transportation, travel lanes. Bookmark the permalink. Kramer Lane is another great example. Traffic flow is the same, it has nice wide bike lanes and lets you avoid less friendly streets like Braker and Rundburg.